Lisa Dougherty is director, blog community and operations at the Content Marketing Institute. She will trade social media and blogging tips for warm pecan bread pudding. Her motto: "Life changes the minute you start doing what you love. And, guess what, it's never too late to get started." Lisa’s active on Twitter @BrandLoveLLC and on LinkedIn. How many of the 366+ blog posts published in 2016 by CMI did you read? While I read all of them (it’s my job), I’m guessing few others did. I get that – we’re bombarded with content every day. 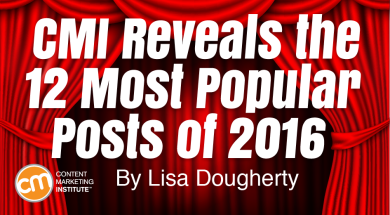 This list runs down the 12 most popular posts in 2016. We used BuzzSumo and Google Analytics to look at several factors (social shares, email conversions, unique linking domains) and added in a dose of editorial discretion. You’ll find they all have one thing in common: The authors dropped a bunch of knowledge bombs on us that we can use right away in our day-to-day marketing. 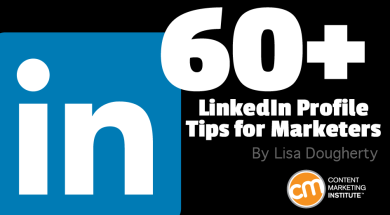 Content marketing careers are constantly evolving, but one thing is certain: The power of LinkedIn for personal branding is here to stay, especially when you’re aware of all the tricks that can help you strengthen your profile.